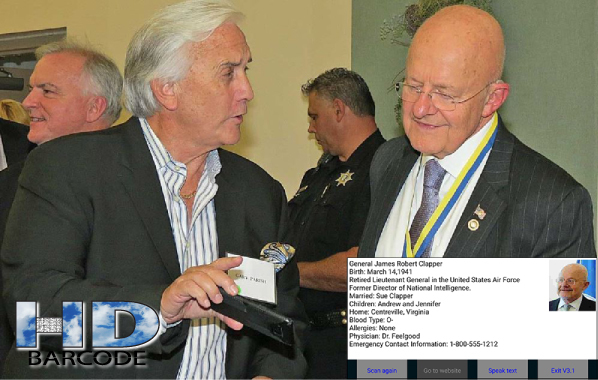 Gary Parish, President of HD Barcode demonstrates their new “HD Positive ID” and “HD Code Blue” to General James Clapper, the former Director of National Intelligence. General Clapper’s photograph, emergency medical and contact information is embedded in the encrypted HD Barcode on an ID Card. No database, Internet or Smartphone connectivity required and only personnel with a secure and authorized Smartphone app can decode and display the information in the code.